I remember talking to a guy that told me how much he hated Paris. Shocked, I asked him why. Well it turns out he visited the Charles DeGaulle airport and didn’t bother leaving the airport area. But what really ticked him off, was that the hotel’s fancy restaurant didn’t know how to make a hamburger! So they chopped up a steak, barely grilled it, and served it on a brioche for $40. So what does this have to do with a vegan hamburger restaurant? 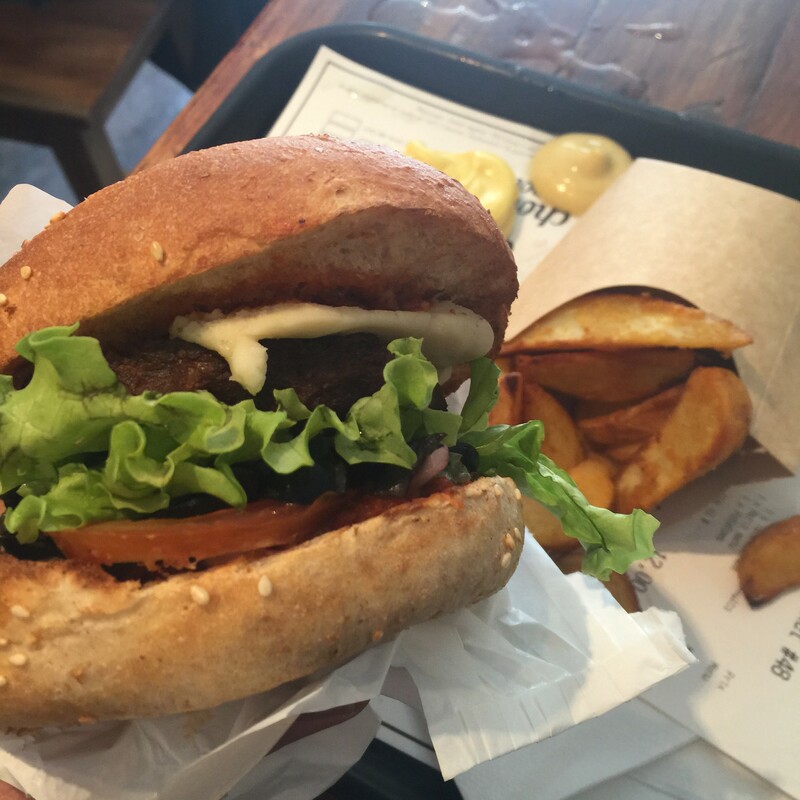 Paris has changed it’s view on the lowly burger over the years. Places like Hippo, McDonalds, and other chains have introduced cheap burgers and bistros have begun featuring fancy burgers more often on their menus. The steak tartar has been cooked, stacked, and covered with a fried egg. Hank is taking this appreciation for the burger and replacing the meat with vegan goodness. The Hankburger menu includes a variety of burgers and side dishes. For those more adventurous tourists, the Touriste burger changes with the seasons. The burgers are seriously hand-crafted. They take their time making sure everything is perfectly placed on the bun. 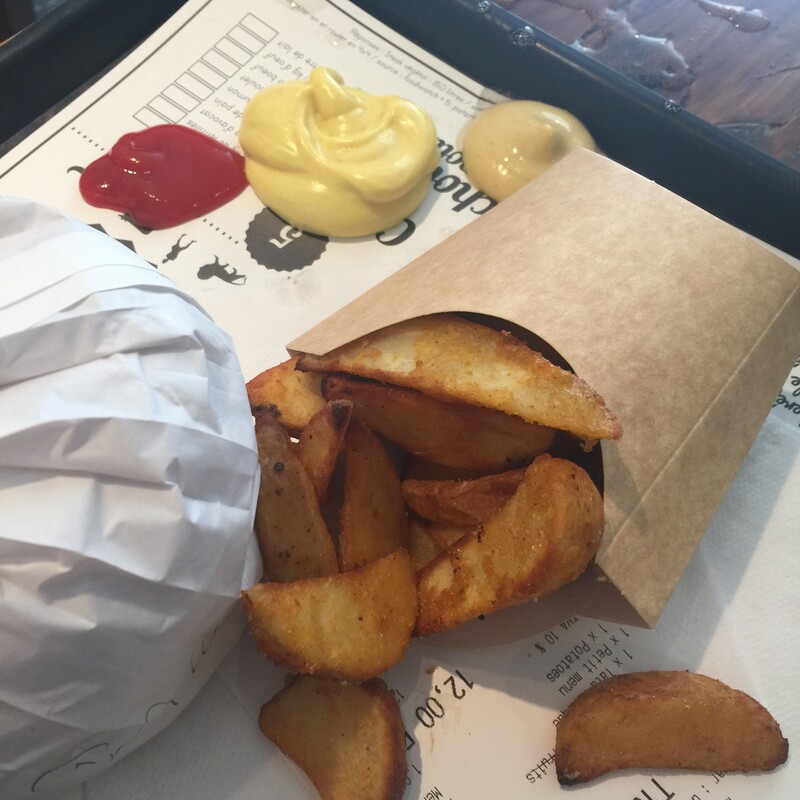 For me, the standout of the meal were the fries and their vegan mayonaise. I’d say Hank falls in the second camp. This was a tasty sandwich, but I wouldn’t call it a burger. I point this out for your meat eating friends, as they may be disappointed by the lack of texture and chew. If they are ready for a vegan sandwich, they’ll be happy customers. 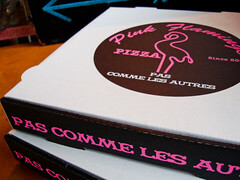 Hank is located in the Marais district on Rue des Archives. It’s a small restaurant with a large takeout clientele. It’s a great street food alternative to the nearby Falafel restaurants. It’s open for lunch and dinner. Accessibility: the entrance and restroom are on the ground floor, but there is insufficient room for a wheelchair to access the restroom. 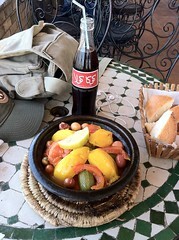 Boring tagine in MoroccoMorocco is a favorite destination for many Parisians. It’s warm, exotic, and French is a secondary language for most people. Moroccan food is also highly appreciated for its spices, tagines, and couscous. Ask a Parisian about Morocco and a smile appears as they remember one of the many little joys of visiting the country. It’s possible to get vegetarian food in Marrakech. 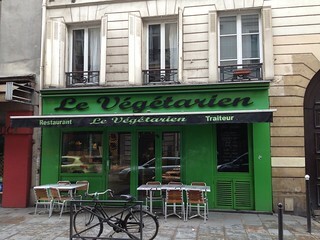 Most restaurants will sell a vegetable tagine. However, I found them to be quite boring. Perhaps I needed to visit better restaurants. You can imagine my delight when walking through the market and spotted some hand made signs for “Earth Cafe” a vegan restaurant. I had to find this place and enjoy a good meal, it did not disappoint. The first thing you see as you step down into this cafe is the open kitchen, a beaming chef will greet you with pride as you enter her domain. 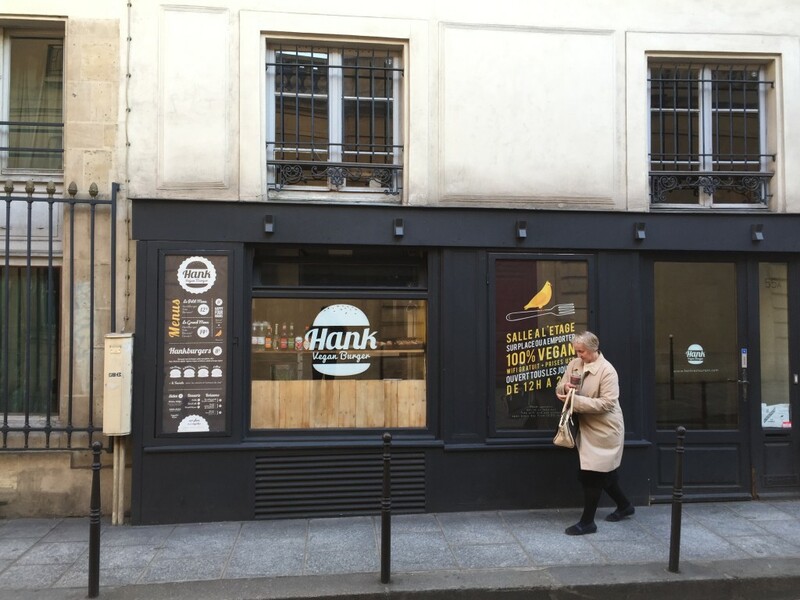 As you pass the kitchen the restaurant opens vertically. What seems like a small space grows to several floors with an open space in the center. I was surprised to see the menu lacked tagines and couscous. How very non-Moroccan! How very refreshing after dealing with some rather banal versions found in other places. Instead you’ll find a creative assortment of dishes that span the North African and Mediterranean flavor spectrum. My meal had a variety of vegetables wrapped in filo dough, baked and placed on the plate with mango sauce. It was delicious and very filling. Earth Cafe also features some yummy smoothies that will hit the spot on a warm African afternoon. The friendly hosts speak French and English. 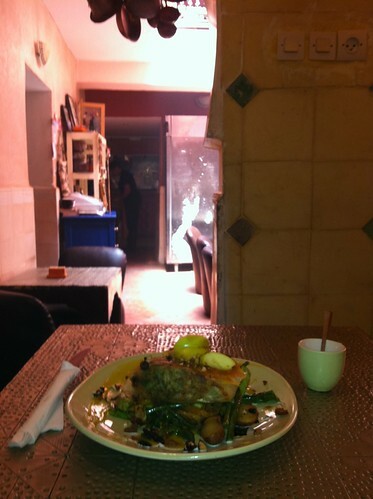 The waiter even walked with me through the souks to find a hammam. You’ll owe it to yourself to visit Earth Cafe when visiting Marrakech. You’ll get great food, great service, and a jovial, peaceful environment. The flavors are so great that your meat eating friends will also enjoy the meal. Accessibility: The restaurant is not accessible to wheelchairs.